SEDS-ASU and SEDS-ASU Rocketry Division are proud to announce that we have been selected to host SpaceVision 2019. SpaceVision is the annual conference of SEDS-USA which brings together students and space industry professionals from all over the country to share their excitement and passion for everything related to space. The conference includes talks, workshops, and discussion panels on topics of space exploration and development. Stay tuned for more exciting information and opportunities to get involved. Last week, SEDS members were thrown into the dark. We told them that we had an activity planned, but know what knew what it was. That way, no one could prepare ahead of time. After all, it was a competition! The secret activity ended up being a SEDS favorite – the heat shield activity! Teams were given 30 minutes, a square foot of aluminum foil, five toothpicks, a pipe-cleaner, a meter of tape, a paper cup, a graham cracker and a single brave green plastic army man who is proud to serve his duty for science. The goal? Teams had to protect the army man while re-entering our makeshift atmosphere against the extreme frictional heat – a blowtorch! Once outside, teams huddled in a circle, secretly wishing that the opposing team’s army man would go up in flames. One team accidentally left some tape exposed which acted like a candle wick quickly engulfing their man in flames. Another team failed to take the thickness of the foil into account and soon had a puncture in their shield wall. The winning team who lasted the longest walked away with cool SEDS-ASU shirts to show off. Keep an eye out on our Facebook page for an announcement about our next fun activity. We will be using the same brave army man, but this time, teams will need to spare his life while crashing to the ground. ​ 2013 has been a fantastic year to Arizona State University’s chapter of the Students for the Exploration and Development of Space (SEDS-ASU). Just a few of the things we have accomplished this year include hosting a very successful convention, winning the chapter of the year award, and having several of our members elected to the national organization. As we reflect on our accomplishments this last turn around the sun, we want to give you a peek at our current efforts to extend the reach of students into the final frontier. For SEDS-ASU, fall semester was a whirlwind of excitement, culminating over a year of planning that resulted in the soaring success of SpaceVision 2013. Four days of panels, booths, late-night brainstorming, keynote speakers, mixers, and a five-star banquet ended with SEDS-ASU being awarded Chapter of the Year. With our industry partners, over 23 chapters, and 400 students attending, SpaceVision 2013 showed that ASU is a mecca for ideas that expand the borders of human reach into the cosmos. Amidst the hubbub of talks on faster than light travel and the discovery of huge stores of water beneath Gale Crater, the council of chapters and the board of directors met behind closed doors. The results of this being two of our own members welcomed into the national administration. Jack Lightholder has been awarded the Vice Chair, and John Conafay is to be Treasurer. Congratulations to both of them, and we wish them luck in their new positions on the national committee. Looking to the future, we see a second launch of the Dust Devils microgravity experiment aboard a ZERO-G flight. Investigating the coagulation and electrification of dust particles in a weightless environment, the Microgravity team hopes to find inspiration for a model of the mechanism behind protoplanetary disc formation and the genesis of asteroidal masses. This mission will take off from Johnson Space Center this April. Finally, a new startup project called MarsTrac is making headway towards its goal of bringing open source to outer space. Using publicly sourced plans and leveraging 3D printers, the group aims at designing off-world construction equipment using in-situ resources. Concurrently, SEDS-ASU has been investing time in certifying members in machine shop skills and building a crash course in 3-D design. If last year was any indication, Arizona State University has only just begun making its mark on the universe. ​ The 51st anniversary of Yuri Gagarin’s historic flight as the first human in space is just two days away. SEDS-ASU will be hosting a Yuri’s Night celebration in conjunction with the Astrodevil’s astronomy club at ASU. Everyone is invited! We’ll be playing a science fiction film, launching glow-in-the-dark water bottle rockets, and enjoying sandwiches and sno-cones. In addition, the Astrodevil’s will be guiding sky-gazing with telescopes. We urge everyone to come out and celebrate the first human space flight with us! RSVP on the Facebook event. Two SEDS-ers hard at work building water bottle rocket launchers in preparation for Yuri’s Night. The Students for the Exploration and Development of Space (SEDS) at Arizona State University is excited to announce that we have partnered with the University of Arizona SEDS to host SpaceVision 2013! SpaceVision 2013 will be held at Arizona State University in Tempe, November 7th through the 10th. SpaceVision is the annual networking conference for SEDS members and affiliates. It will provide an opportunity for the future bright minds of the space industry to mingle with current industry leaders. This year’s attendees can expect a gamut of excellent speakers, opportunities to network with potential future employers, and a fantastic experience in Tempe. Conference updates are happening daily. Check us out online! SpaceVision 2012 is upon us! This year’s national conference for the Students for the Exploration and Development of Space in Buffalo, NY, will feature speakers who are prominent in the space and aeronautics industry, as well as some exciting presentations and experiences for students from SEDS chapters across the country. SEDS-ASU will be live-tweeting the entire conference at the Twitter handle @sedsasu, so follow us to be included in some spectacular talks from speakers such as Robert D. Cabana, Director, NASA Kennedy Space Center, and George Nield, Associate Admin., Commercial Space Transportation, FAA (also, find out whether SEDS-ASU has been selected to receive SEDS national awards!). We will also be updating the SEDS-ASU Facebook page, so be sure to “like” us on Facebook. Don’t forget: SEDS-ASU will hold its weekly chapter meeting on Wednesday, November 7. We will be hearing from Dr. Joe Foy, an Arizona State University alumnus and current professor. He has previously conducted research in space and solar physics at NASA’s Marshall Space Flight Center, and is presently interested in understanding the physics of nebulae pulsar winds. Be sure to join us and brings your friends! Well, the first meeting of the fall semester was a success. We saw many new faces and sincerely hope they continue to return. This is the first time we’ll be doing this, so I’m sure things will smooth out as we continue. But for those who were unable to make the first meeting, we felt it would be a good idea to post a meeting recap here. This meeting served as an introduction of sorts to SEDS, the officers, and what we have in store for this year. Please look through the power point, and let us know if you have any questions! Today, SEDS had the honor of being invited to a special luncheon sponsored by the Barrett Honors College and TEDx, featuring Astronaut Dr. Cady Coleman. After being introduced by Barbara Barrett (who has also been trained as an astronaut), she gave a very entertaining and informative talk, regarding life in space during her six-month mission to the International Space Station (ISS) during Expedition 27. Focusing mainly on the scientific research performed on the ISS, Coleman gave an overview of the various types of research the astronauts do. From fluid dynamics to combustion, there is quite a bit that goes on in the orbiting laboratory. She even cited some exciting research being done in collaboration with ASU’s very own Biodesign Institute. The work being performed on the ISS provides great insight into aspects of nature that cannot be observed under the effects of gravity. Flames behave differently, and perfect crystals can be grown in the microgravity environment. Coleman mentioned her favorite experiments to perform involved fluid dynamics, and when she performed certain tasks, such as adding air to the fluid, the fluid did not behave as the scientists back on Earth predicted. There are many questions still waiting to be solved, thanks to our astronauts on the ISS. Coleman also shared a fun video of her playing a flute duet with the legendary Ian Anderson of Jethro Tull, while she was in space and he was on Earth! After her talk, she had a Q&A period, and the students attending had the opportunity to ask her their own questions of what it was like to live in space. She even stayed to meet each of us in person, when all our questions were answered. This is actually second time SEDS has had the opportunity to meet Cady Coleman. 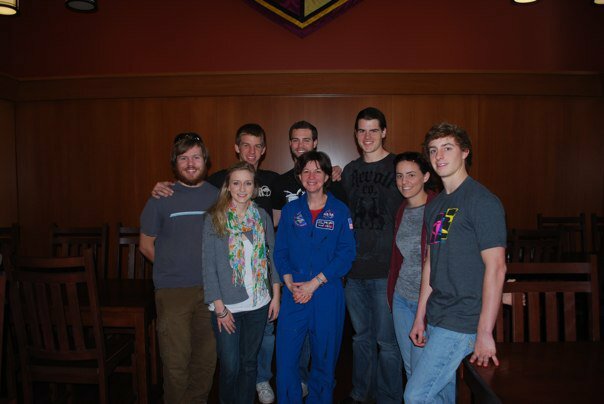 We were invited to meet her at a similar luncheon two years ago, before her most recent trip to space. Like last time, she was an overall wonderful person and always a pleasure to meet. We at SEDS would like to thank Dr. Coleman for visiting ASU once again and sharing with us her spectacular experiences. We wish her well on all her future endeavors!